One the best things I ever bought was a Sky Digibox. I absolutely detest watching dubbed programmes in French, so it's saved much ranting and moaning. 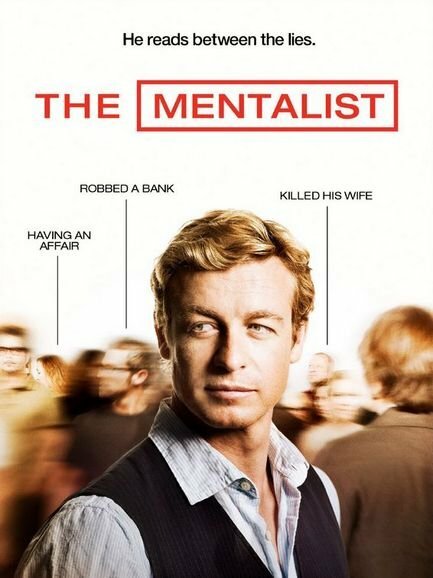 My favourite series at the moment is The Mentalist and it seems I'm not alone in that judging by the ratings and the Mentalist evening last night. I hadn't realised it was so popular, or that Simon Baker is Australian, or that Owain Yeoman (Rigsby) is from Chepstow (went to Oxford and left to attend RADA)! In an interview with Simon Baker, he said that when he got the part, he decided he wanted to have as much fun as possible, and it's true that he plays the role with much cheekiness and humour. This is a lot of the serie's charm in fact. It's also a huge contrast to the way he had to play Nick Fallin in The Guardian which is on early evenings at the moment. There he is a repressed corporate lawyer who always seems to be dashing out of rooms and avoiding close relationships. On the other hand, I've stopped watching 'Poubelle la Vie', oops, I mean Plus Belle la Vie on French television. Not because it's dubbed, because it isn't, being French, but because the storyline has got a bit ridiculous and it's on at the annoying time of 8.10pm which is when we eat dinner. This means that if we want to watch it, and when one is following a soap, one usually wants to keep up or lose the plot, we can't have a nice chatty meal. I don't like the television being on when we eat, so weaning myself off PLV and banning it from the dinner table will enable us to engage in something resembling conversation when the boys get back. I think a lot of French people must eat and watch tele at the same time, either the news or PLV because 20H seems to be the prime viewing spot and it must be because there's a captive audience. FR3 caused a riot on the other channels when they rescheduled PLV to 8.10pm because of its popularity which meant audiences were not watching the news with their highly paid anchor newsreaders. French news programmes are also pretty crap. Competition is so cool for stirring things up, don't you think? There's nothing on French television that I watch avidly actually. As I don't like dubbing, that removes a huge chunk; I find Arte pretty boring on the whole, and while there are some interesting programmes like Capital, there's nothing I would think twice about not going out so I could watch it. D'accord, d'accord... TV during dinner is the beginning of the death of the family. DVR is the solution to the problem of missing good stuff during dinner time. Not that there's any good stuff at the moment.